It's been almost a year since the launch Windows 8And most users were already accustomed to The Start Screen which replaced the classic Start Menu currently Previous Windows. However, many users would like it to have some more customization optionsSuch as the possibility of fix in Start Screen files or folders for faster access to them. Fortunately, the missing customization options Start Screen it can be added by means of third-party applications, Such as Pin to 8. 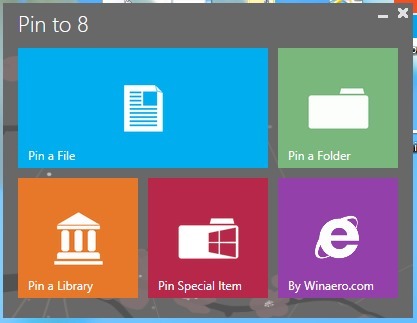 Pin to 8 is a free si portable (Requires no installation) Windows 8 that enables users of its operating system set (pine) In the Start Screen files si folders which they often use to be able to access them quickly when needed. 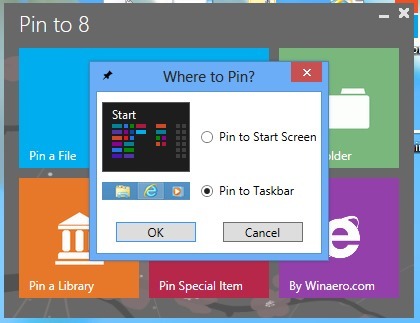 How to use Pin to 8? Using Pin to 8 application is relatively simple, the user must select through application file or folder you wish to set the Start Screen. The application also offers users the possibility of secure the files and / or folders in taskbar. can start to fix the Screen / Taskbar system utilities (shell objects), Such as Run, Window Switcher etc. Note: App compatible with Windows 8.1.